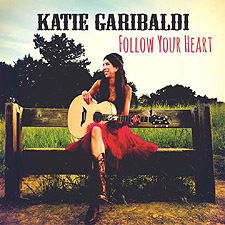 Recorded at John Vanderslice’s Tiny Telephone Recording Studios in San Francisco, CA, and engineered by Ian Pellicci, Katie Garibaldi‘s Follow Your Heart is not only her seventh full-length release, but quite possibly her best yet. Indeed, Follow Your Heart (sentiments I think we all agree we should try to live life by) is Katie’s first release of all new compositions since her award-winning Next Ride Out album from 2009. Five years off from writing and recording has definitely enhanced this lady’s musical traits though as here on the new album she has obviously learn many lessons from simply touring around the country. A deeper love and respect for the music she abounds within, here on the new album she is accompanied by Bay Area local Todd Richardson on drums and percussion, the Magik*Magik Orchestra, Michelle Kwon (The Delphi Trio) on cello and Phillip Bezina (Brothers Comatose) on violin. Indeed other notable musicians include Max Butler (pedal steel, mandolin and ukulele), Sylvain Carton (flute, clarinets and saxophones), Henry Hung (trumpet, trombone), Matt Blackett (electric guitar), and Shawn Shaffer on harmonica. Every single track on this delightful new album from Garibaldi is a real gem, trust me. All 13 tracks not only sound personal to her, but one (rightly, as it turns out) assumes that they are very deeply personal to her. Attached to the lyrics of each song in a way someone is to their favorite heirloom, Garibaldi’s vocal tones, depth of soul can be heard of each and every one of the tracks. With her incredible host of grouped musicians backing her at every musical turn, the lady who has been featured on the cover of The Indie Bible four different times brings her emotional resonance and soulful emotion to these sometimes pop-inspired, mostly country-tinged folk-rock songs like her life depended on it. She may well have been compared to mainstream stars such as Sheryl Crow, Taylor Swift and even Jewel, but believe me when I say that Katie Garibaldi is her one and only; and we can only hope she stays that way.